Born and raised in Barbados, now a Boston resident Elan is working as a teacher in the Boston public school system shortly after he graduated with a Bachelors degree in Music Education at Berklee. Besides this day job Elan succeeded in building up his career as solo-interpret. His first album Memories - The Debut (2001) is strongly influenced by Caribbean music, his sophomore album Let’s Have A Good Old Time (2005) is a gospel jazz album, his third album A Reggae Christmas (2007) features popular Christmas carols in a jammin' reggae style. With his fourth album This Time Around (2009) Elan explores the smooth jazz genre. After the demise of most smooth jazz radio stations is no need for any artist to stay "radio friendly". 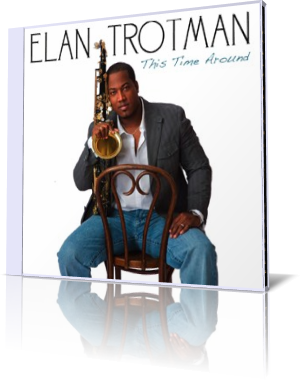 Elan wrote or co-wrote most of the tracks on this album supported by musicians like guitarist Tyrone Chase, trombonists Derrick White and Andre Hayward, trumpeter Patriq Moody and drummer Nikki Glaspie. His intimate knowledge of smooth jazz saxophonists like Kirk Whalum, Grover Washington Jr. or Warren Hill is certainly the key to musical success. In the opener Lil' Too Late, the title ironically mirrors today's music business situation, one finds all ingredients which make this genre so popular. Elan bonds his audience with the title track featuring pianist Odie Tekken and bassist Chris Loftlin in excelling solos. Me N' My 22's finds Elan in a duet with brilliant trumpeter Patriq Moody battling around a theme. On 100 Degrees Elan extensively but perfectly uses the overdubbing technique. This method facilitates accurate harmonies with the same instrument like a chorus line. The still poular handclapping beat is after my humble opinion a little stale. Nu Skool 2 Kool offers thanks to Coran Henley a more complex drum programming. Elan's sax performance is supreme. 4:05 P.M shows how a singer can transfer a tune to a divine level. Athene Wilson's vocals are just phenomenal. Athene Wilson's multi-faceted vocals have resonated internationally across stages in Germany, France, Japan and the Caribbean. Crusin' is Elan Trotman's own recommendation for the next Smooth Jazz Cruise 2011. Relaxation pure. The urban As Long As I Got You brings Derrick White on stage. This easy going interaction between sax and trombone is since Jeff Bradshaw's Bone Deep and Barry Danielian's Common Ground one of my favorites. Elan's creativity excels on Conversation. Evan "Da Troof" Brice's genius strike to mix the marching band rhythm with hip hop beat and the whole arrangement are truly innovative. A further highlight of the album is the horn arrangement with exuberant solos by Elan (sax), Andre Hayward (trombone) and Patriq Moody (trumpet) on It's Alright, which reminds me of the group Incognito. On Oh Yeah Do It Elan conjures the funky times of Cameo. Like many other smooth jazz musicians (Michael Manson, Luico Hopper) Elan couldn't resist to cover Lovely Day, Bill Withers' smashing super hit from the album Menagerie (1977). Why not? I love this song. Elan closes the album with the uplifting and eruptive Don't Stop Believing. Fifteen songs and no filler, that is amazing. My respect!